At the end of October 2017 I was lucky enough to visit our best-selling European ride, Los Alamos based in Andalusia, Spain. During this visit I quickly came to realise what makes guests return time and time again. Andrew, Rhiannon and Rachel, my hosts at Los Alamos offered me a friendly welcome and I instantly felt at home. Andrew and Rhiannon welcomed me at the airport and at the villa with a warm greeting and home cooked lunch before Rachel (horse manager extraordinaire) introduced me to the horses. The horses at Los Alamos are brilliant. Ranging between sparky thoroughbreds, Pure-bred Andalusians, Arabs and Andalusian crosses each has their own personality and quirks as with any herd of horses. However, from the moment you mount up you feel safe and secure with Rachel having worked her magic and matched you with the right horse. Through the week I rode three different horses and wish I could have brought them all home. 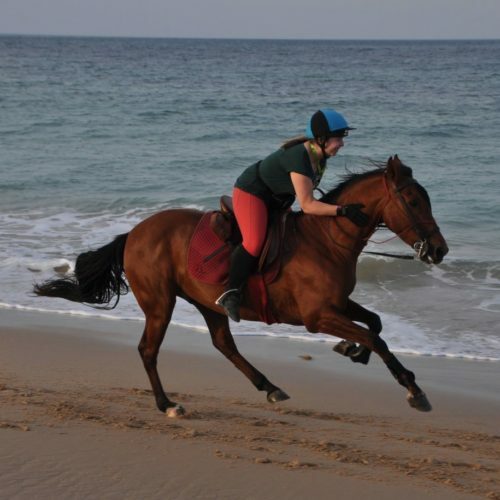 Exploring the forests and the beaches of Cape Trafalgar on horseback has given me some fabulous memories to cherish. There is nothing like the feeling you get galloping up a fire break, cantering along a twisting forest path or splashing through the surf on a fit, well-schooled, forward going horse. During the week we stopped at some lovely little local bars for lunch and ate some simple yet delicious traditional Spanish food. From Spanish omelettes, fresh fish, meat and vegetarian dishes there is always plenty of food to go around. Evening meals were a mix of dishes from Italian, Spanish and beyond. Rhiannon manages to cook meals to suit everyone she has around her dinner table. After visiting Los Alamos it isn’t difficult to understand why places get booked up so quickly! If you’d like to read more about my week at Los Alamos you can read my blog here.